I heard yesterday that the 121's have gone to production and should be available hopefully for the Christmas market in 2015. Have you a credible source for this? It seems to fly against recent consensus. I was on murphys site yesterday and the 121 class is still in under their "future plans" banner.Nothing with about any production or release dates. I don't know how credible Marks Models is but that's who mentioned it to me. Xmas 2015 is only a couple of weeks before the beginning of 2016 so the two indications are not a millions miles apart. I'll be here when it's here I suppose but it seems safe to say that we wont see it until the 201s and mk2s are all made. €900,000 retail costs / run of 5000= c. €180 each, sounds about right given the increase in costs that Bachy et al have had to pony up from China. Irregardless of the validity of the timeline mentioned, what would I like in my collection? A twin pack of 124 and 134 in the condition that they last ran in would be sweet. Blanked out cab windows. You could run them as a pair, or pair one with a baby for a bit of variety. Why did IE blank off those centre windows? I'm not sure what was the reasoning behind it. I think 123 and 133 were done also. Would 'crowd funding' be an option in consultation with Paddy Murphy? I'm guessing €250k would be the number needed to move this to production. Would very quickly indicate if there is a genuine demand or not! I think the problem with this would be 'what if the company go bust in the meantime?' and if the answer is no then it could be messy to send all the money back to those who ponied up. And personally I wouldn't part with cash until I've seen at least a test model in case there's a major accuracy blunder. An alternative is do as smaller companies in the US and Canada do like Rapido Trains. Set a deadline and say that if the company receives x amount of preorders in that time then the project will go ahead, if not hard luck! As far as I know they don't take deposits but maybe this would be an option. As much as I'd love a few 121s, at the same time I'm not in much of a hurry. The reason being is that once PM releases the 121s where do we go from there? Is that it from PM. 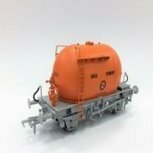 Do we get the MM treatment for a future A and C class maybe. Do we get the MM treatment for a future A and C class maybe. Don't make me drool! Plenty of coaches and wagons to do. 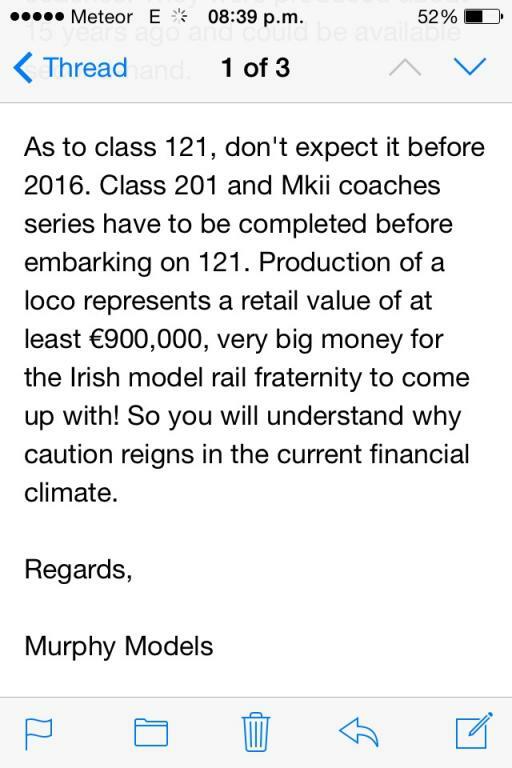 The same source said that the A class was being considered by Mr Murphy as a follow on project. a pack of 124 and 134 with one being a dummy unit would be a good idea I think, may also help keep the cost down a little without the second set of running gear. it would be simple enough to remove the motor and leave her a dummy, so i wouldnt worry about that aspect - lets hope she will go into production first! Very nice prospect.Such a nice sight when double headed. I picked up a 210 for a nice price on Sunday - a chap had been given it as a present by somebody who thought it was 'a nice colour' - which it obviously is - but, it didn't really fit on a GWR layout. Cheers Ed. IE logo, led lights and blanked out cab windows was the condition I was referring to. There are a fair few external differences in the 141-181 locos that PM captured on the models. I'd say if the Grey 071s were about before the models came out it might have been different. I want to get an 071 . Funds only just allow for one. My heart says black and orange. Or maybe black and silver. BUt my head keeps saying grey. Cant decide. Get 073, it's the best factory weathered loco out of the box I have seen. That and 088 in GM golden brown are my two top 071s of the lot. 078 and 085 annoy me with their black tablet catcher mounts, they were never black in their modeled liveries and won't get them because of that.